Dillon Toyota Lift's training classes are designed for your company and its employees. Our trainers will ensure that your facility is operating safely within OSHA requirements. Forklift training classes are available at your facililty or at any Dillon Toyota Lift location. Dillon Toyota Lift offers a wide selection of safety training materials from video training kits, daily inspection checklists, lock-out/tag-out kits, personal protection equipment, training certificates, wallet cards, and more! Operators of all powered industrial trucks must be fully trained and employer certified as required by federal regulation. Dillon Toyota Lift's Operator Training class is designed for forklift operators. 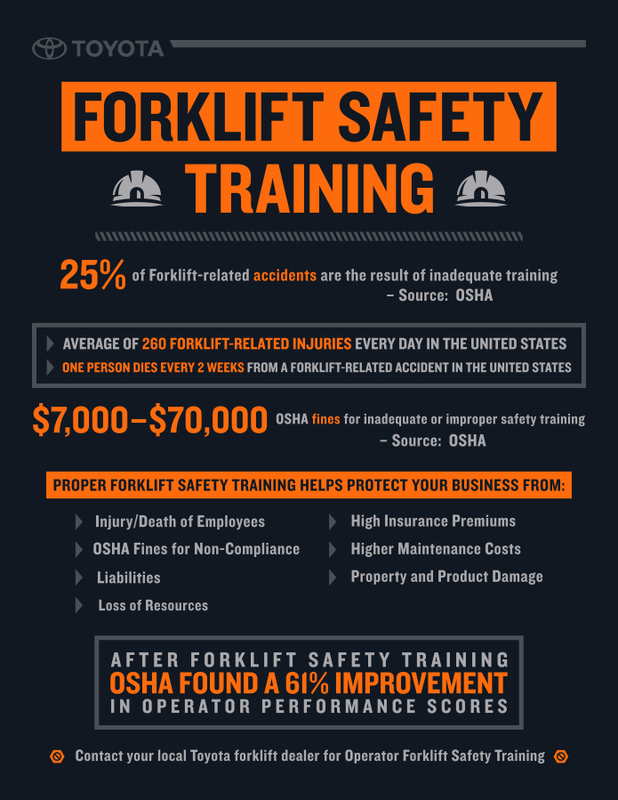 This course provides instruction on forklift safety regarding the equipment in your workplace. Operators review the top causes of forklift accidents, understand the stability of a lift truck, daily operator checklists, refueling propane/gas/diesel trucks and battery & charger procedures. Operator training course includes classroom discussion, videos, instructor demonstrations, written test and driving evaluation for one type of forklift. Class is available at your facility or any Dillon Toyota Lift location. Do You Meet OSHA Training Requirements? Providing safety training is the responsibility of every employer and training must be completed prior to operation at your facility. Refresher or re-certification training must also be conducted at least once every three years. The Occupational Safety & Health Administration (OSHA) has very clear standards that employees must follow. The requirements and regulations for material handling equipment vary by type of equipment, but we can help your company stay in OSHA compliance. Dillon Toyota Lift's expert instructors train operators through a course of formal instruction, practical training, and evaluation of workplace performance to keep you in compliance with OSHA training requirements. Visit OSHA 1910.178 for more details. Class designed for companies to provide their forklift operators with an in-house OSHA compliant training program. In addition to learning the safety principles taught in the operator training class, your Dillon Toyota Lift trainer reviews OSHA regulations, classroom preparation and procedures for performing a hands-on evaluation. Train the Trainer course includes training materials for one type of forklift and classes are available at your facility or any DTL location.